Jayson Sibley was raised in the ambient of a small commercial fishing and boating community in the United Kingdom. As a direct result of this, he gained the required ‘hands on’ experience, and became involved in yacht construction, and repairs from an early age. After leaving school he was a student at South Tyneside Nautical College and Glasgow College of Nautical Studies where he studied under regulations set by the Department of Transport and the MNTB. He attained the RYA / Dot Yachtmaster Ocean Commercial Certificate at an early age and continued to gain further academic achievement which includes a Diploma in Yacht and Small Craft Surveying with Merit. Jayson was the first European member of the International Association of Marine Investigators (IAMI) to sit and pass the Certified Marine Investigator Examination. He also holds an IAMI Instructors Card. 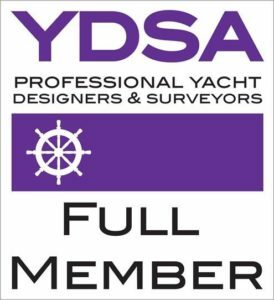 Professional recognition of his expertise has been recognised and he has become an Accredited Surveyor & Full Member of the Yacht Designers & Surveyors Association (YDSA), one of the highest regarded achievements in the industry. To achieve this accreditation his expertise and survey reports have been fully vetted by the association committee. Additional academic achievement includes a Masters Degree in Yacht Claims, and the Cardiff University Bond Solon Expert Witness Certificate. He has also taken the Lloyds Maritime Academy Postgraduate Diploma in Maritime Law. He has also been granted Full Membership of the International Institute of Loss Adjusters (IILA) and Membership of the Chartered Institute of Loss Adjusters (CILA). Jayson Sibley is the author of the Yacht Claims Handbook and numerous technical articles published in sailing magazines and association newsletters.